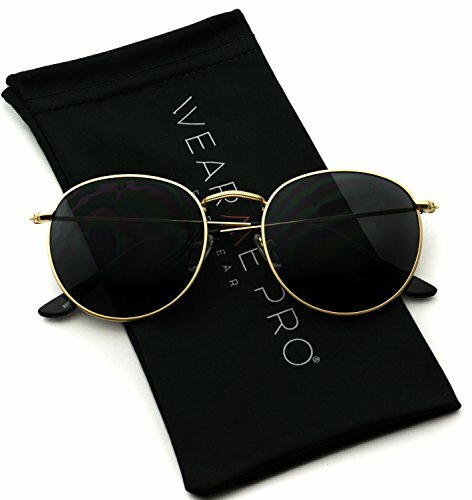 BRAND - WearMe Pro is a family-owned eyewear brand founded in the United States. WearMe Pro is passionate about providing affordable eyewear but also about helping local charities. Thanks to the ongoing support of our customers, each year we donate thousands of glasses to children in need. 100% UV400 PROTECTION - WearMe Pro's sunglasses come equipped with HD lenses that can filter out sunlight glare. WearMe Pro lenses protect your eyes from long term damage by blocking harmful UVA and UVB rays. MATERIALS - Sturdy metal frame, colorful mirrored and black lenses, solid metal hinges, exquisite temples, all these details ensure long lasting wear and comfort! SATISFACTION GUARANTEED -Our #1 priority here at WearMe Pro is your happiness! Which means we stand by our product 100%! We are always here to resolve any issues you may have with our product, simply reach out to our support team for a prompt resolution to your concerns.